Welcome to what we hope is the first of many contests here at BookSeries.org. This contest runs until August 31st, 2017 at midnight EST. The winner shall win a Kindle Paperwhite e-reader pictured to the right. 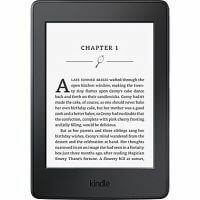 Or the equivalent amount in Amazon gift cards if you don’t want a Paperwhite. Everyone can get an entry after logging in by simply clicking to “Enter”. There are then multiple bonus entries including leaving a comment below the contest on what the last book you read was. That’s the highest valued one for entries so we recommend doing that. Now get started and be sure to come back daily – you can earn one entry every single day. Winner will be notified on September 1st, 2017 and we’ll get your Kindle or gift cards shipped right out that very day. By submitting your entry you confirm you are eligible to win a prize based on your jurisdiction. No Quebec sorry.